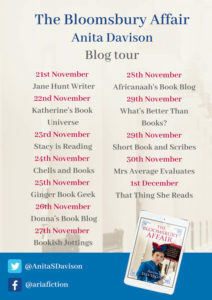 I’m so pleased to be sharing an extract from The Bloomsbury Affair by Anita Davison today as part of the blog tour. Look at that gorgeous cover! My thanks to Vicky Joss from Aria for the place on the tour. ‘Good evening, everyone. Do forgive my being late.’ Bunny strode to the table where he shook William’s hand vigorously and kissed Alice’s cheek before taking the remaining empty chair. Flora signalled to Stokes to serve the dessert, when Alice placed a restraining hand on her arm. ‘I always loved your name, although Alice is equally charming,’ William, said, his gaze never leaving her face. Flora directed a ‘see what I mean?’ look at Bunny, whose lips twitched as he poured himself a glass of water. ‘William was about to tell us about his recent trip to St Petersburg,’ Flora said, steering the conversation back to firmer ground. Despite an overweening ambition to reunite her parents, watching them staring into each other’s eyes like prospective lovers made her feel uncomfortable. ‘I thought Tsar Nicholas’s father, Alexander, had abolished the serf system? Or am I being naïve?’ Flora looked to Bunny for his reaction, but he absent-mindedly broke apart a bread roll, his attention elsewhere. ‘He’s taking a hard line with anyone who raises a voice against him,’ William replied. ‘Tsar Nicholas is the richest ruler in the world yet he prefers to live like a country squire devoted to his wife and children. Matters of state take low priority. He avoids making decisions unless forced to, and when he does, he overreacts because he has this morbid fear he’ll be assassinated like his grandfather.’ He paused to take a sip of wine, his eyes troubled. The conversation trailed off when Stokes reappeared with a covered plate he set before Bunny, lifting the lid like a magician, releasing a savoury aroma of roasted meat. ‘This looks wonderful, Stokes, and very welcome.’ Bunny rubbed his hands together over his plate. Stokes inclined his head with a wry smile implying he claimed full credit. ‘Were you there for that protest march in St Petersburg when those workers were shot?’ Bunny became more engaged in the conversation, perhaps because he was no longer hungry. 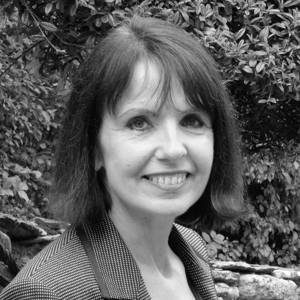 ‘Don’t they educate royal children in Russia?’ Flora tutted. After his initial enthusiasm, Bunny appeared to have stopped listening and had resorted to picking at his food, his thoughts far away. 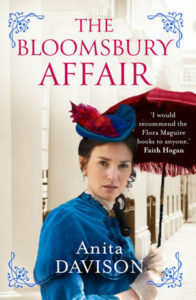 ‘Is everything all right?’ Flora asked in a whisper. ‘Don’t I always?’ Bunny smiled briefly but his amiable mask slipped slightly, convincing Flora something was bothering him. ‘How can you say that if you were there?’ Her voice hitched slightly. ‘No, really. I want to know.’ Flora waved her away.